Full prize winner details are available from the Armourers and Brasiers' website. 2018 - Dr Szymon Kubal, Dr Cameron Pleydell-Pearce and Dr Adrian Walters, Kubal-Wraith Ltd, a spinout company of Swansea University. 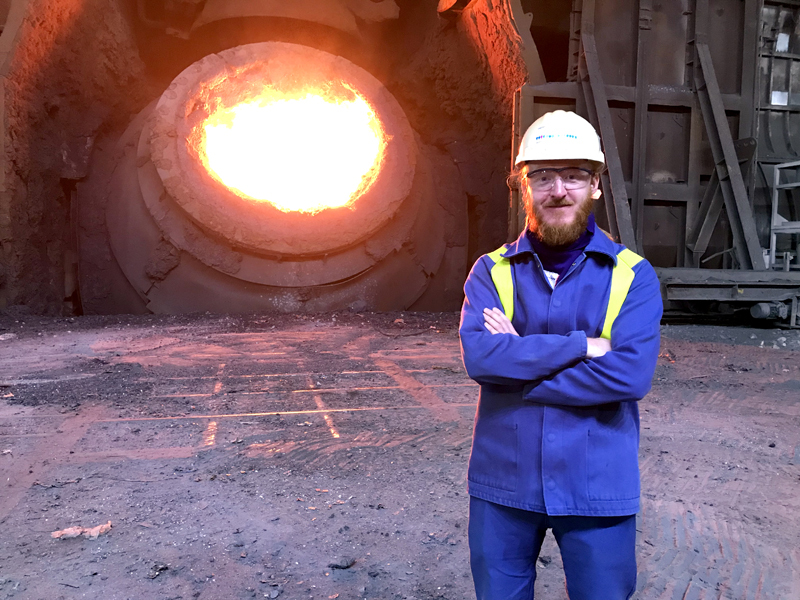 Steelworkers will be able to monitor in real time the chemical composition and temperature in molten metal furnaces, for the first time, thanks to a breakthrough technology currently being developed by Kubal-Wraith Ltd.. Recent advances in refractory manufacturing and laser metrology have been adapted and combined to enable continuous monitoring with no break in production. The new technology allows a laser beam to be projected into a molten furnace through a refractory gas-swept channel (tuyère) in the furnace wall, and the latest gas injection techniques are exploited to protect the data channel. Whilst steel plants will be the first market to be targeted, the technology is applicable to other metal making sectors such as aluminium, copper and nickel. 2017 - Henrik Hagemann and Gabi Santosa, CustoMem Ltd.
Development of a novel biomaterial that filters out harmful micropollutants. The granular adsorbent is capable of the specific binding and removing of target micro-pollutants, including pesticides, pharmaceuticals, high performance chemicals and heavy metals, from wastewater. It will be particularly relevant at commercial airports, oil and gas operations and at military installations where there are significant micro-pollutants. CustoMem is based at Imperial College's Incubator and supported by SynbiCITE, the Royal Academy of Engineering, Innovate UK, and Climate-KIC. 2016 - Professor Geraint Williams, Patrick Dodds and Dr Adrian Walters, Hexigone Inhibitors Ltd, a spinout company of Swansea University. The project team has developed an alternative to hexavalent chromate, the commonly used corrosion inhibitor facing an EU ban in 2019. The replacement technology developed by the team is a material and manufacturing process for a smart release coating which outperforms hexavalent chromate in laboratory tests. The development team believes the new product and process offer a smarter, safer way of reducing corrosion. The technology is environmentally sound, economical and outperforms the market leader in laboratory tests. It creates a stored reservoir of corrosion inhibitor and works by channelling aggressive electrolyte anions into the coating, triggering the release of the inhibitor 'on demand', thus preventing corrosion. 2015 - Dr Michele Barbour, Senior Lecturer in Biomaterials in the School of Oral and Dental Sciences is the Chief Scientific Officer of Pertinax Pharma Ltd, a spinout pharmaceutical company of the University of Bristol. Development of Pertinax, a new formulation of chlorhexidine (an established antimicrobial agent). It is hoped the new formulation will be able to eventually provide protection against antibacterial and antifungal infection for weeks, months or even years. The initial focus will be on the dental market, with other possible applications include catheters and wound care products, which are especially prone to infection by antibiotic-resistant bacteria such as MRSA. 2014 - Prof Iain Gibson, a biomaterials chemist at the University of Aberdeen is principal investigator of the SIRAKOSS MaxSi® Graft technology. The SIRAKOSS MaxSi® Graft technology produces a purely synthetic material that mimics bone. It has the potential to treat many thousands of patients who need spinal fusion surgery for back pain, or repairs for bone injuries. The Prize will progress efforts in achieving regulatory approval for clinical use. The aim is to MaxSi® Graft technology approved for use in patients in two years' time. Further development of new bioactive particles (that enter holes in teeth, physically blocking and repairing decayed teeth) which are already produced successfully in the laboratory into a prototype toothpaste. Development of manufacturing processes for transparent conducting oxide (TCO) coatings for new-generation solar photovoltaic cells.